The right to build on, occupy, and/or profit from the air above a piece of real estate. Supposedly, air rights have existed as long as the concept of private property, but it became important in the 20th century as air travel became more common. In the United States, air rights only extend to the amount of air that one may reasonably occupy. As with other aspects of real estate, air rights may be sold, leased, or otherwise acted upon either in conjunction with or separate from the property to which they are attached. See also: Mineral Rights. So the board felt that instead of continuously getting these delays by trying to get some agreement with the park district, it would be best to just go off and build something that we know complies with the air rights. Through the transfer of development rights, heritage building owners could profit from the permanent sale of their air rights, while keeping their old homes. 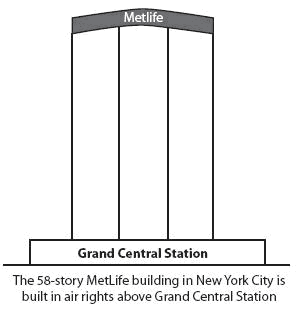 Lago released a memo stating that 90 percent of the available air rights in the district have already been transferred. Air rights may be divided into separate units of real property created by the horizontal subdivision of real estate. The subsidiary will now enter into a modified lease-purchase option so that the air rights can be transferred in the most tax efficient method while still protecting the subsidiary's rights under the original agreement with the landlord, Rick's Cabaret said. Collegiate and Joint Venture maintained the highest and best use of their properties was a residential condominium building to be built on an assemblage of the properties at 198, 200, and 204 Broadway, along with the air rights from the properties at 192 and 194 Broadway. At issue is air rights above Garland Street, which runs behind the old Arkansas Bar Foundation building and the DoubleTree. They stand to make millions on the sale of the air rights. In addition to the in-place revenue stream, the property is being sold with air rights that allow for the potential construction of a 14-story tower. If zoning laws permit it, acquiring air rights from nearby owners who don't plan to use them allows a developer to build higher than zoning restrictions would otherwise allow. Emirates, Etihad, Qatar and Turkish have achieved the limit of air rights and slots made available to them. Forest City Enterprises Inc (NYSE: FCEA) (NYSE: FCEB) (FCE), a US-based reality investment company, has closed a sale of land and air rights of around 16 acres of property to Rock Ohio Caesars Cleveland LLC, a subsidiary of Rock Gaming LLC.